Celebrate your first holiday season together with a customized wedding ornament from Frederick Engraving. Our fully personalized wood or lucite ornaments look great on your front door, tree, or mantle. Our quality craftsmanship will help you remember this special day for years to come. 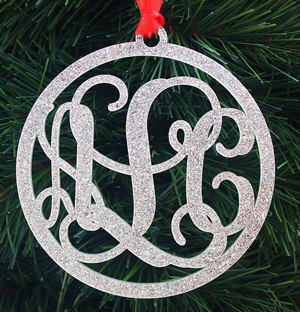 For a truly classic look, choose a laser cut monogrammed ornament. The initials in our monogram ornaments are laser cut custom to your specifications. At Frederick Engraving, we designed our custom holiday ornament line with commemoration special occasions in mind. We have multiple options to celebrate life's milestones, including baby’s first Christmas ornaments, a wedding ornament, and an engagement ornament. Ornaments are available in both wood and lucite, for a rustic and natural or classic and minimalist look. Engraved lucite has the look of etched glass, without the risk of breakage. A laser cut name or monogram ornament is a great choice for anyone on your list. Still planning your wedding? Celebrate the holidays with a custom engagement ornament, then let us help make your big day special. Frederick Engraving offers many custom items that are perfect for wedding favors, bridesmaid gifts, or commemorative family gifts. All are fully personalized and affordable, with no minimum order. The wedding range includes laser cut and engraved cufflinks for ushers, the fathers of the bride and groom, and groomsmen. Fun wedding party flasks are fully customizable with name, message, and motif. Personalized golf balls and tees can be fun keepsakes from a low key bachelor party. Monogram jewelry, including cufflinks, necklaces, and earrings, is another great choice to say “thank you” to those who are there on your special day.